As business owners and marketers, we know providing answers to our existing and prospective customers’ questions about our products, services, or solutions is an important part of acquiring and retaining new business. Providing easy to find, clear answers to these questions enhances the visitor experience and works to establish expertise, authority, and our websites as destinations. No one understands this better than Google. Lets rewind to September of 2013, when Google overhauled their search algorithm which was referred to as the Hummingbird update. Hummingbird represented the largest change to Google’s search algorithm in 12 years and is part of Google’s plan to become less reliant on keywords. 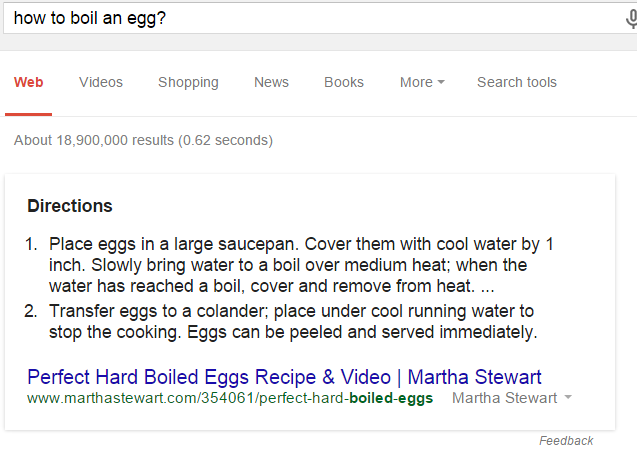 Shortly after the release of the new algorithm, Google searchers started noticing small answer box type results appear for various types of queries that included everything from vs. type searches to questions such as “how to boil an egg?” and “who is the Secretary of State.” These new results showed Google directly answering searcher queries using data from its Knowledge Graph and through having a deeper understanding of the contextual meaning of webpages. So just how many answer box results are there? At this point, only Google may have the answer to this question, but it’s likely the number of answer box results being returned for Google searchers is growing every day. To add perspective, Eric Enge and the Stone Temple Consulting team tested over 850,000 search queries that they felt had a high probability of returning answer box results. These queries included a combination of manually compiled queries in conjunction with Google and Bing auto complete results across a diverse set of industries. For this sample of keywords, the test results showed that Google returned an answer box result 19.5% of the time. So will answers boxes help or hurt my business? It depends. If you’re ranking below an answer box result, chances are high that you’ve noticed a decrease in organic search traffic. For webpages that are receiving an answer box, if a query can be completely resolved, there’s little need for a user to click-through to the resource. However, if the topic is fairly technical in nature a searcher may be more inclined to visit the actual webpage that is being referenced in the answer box. 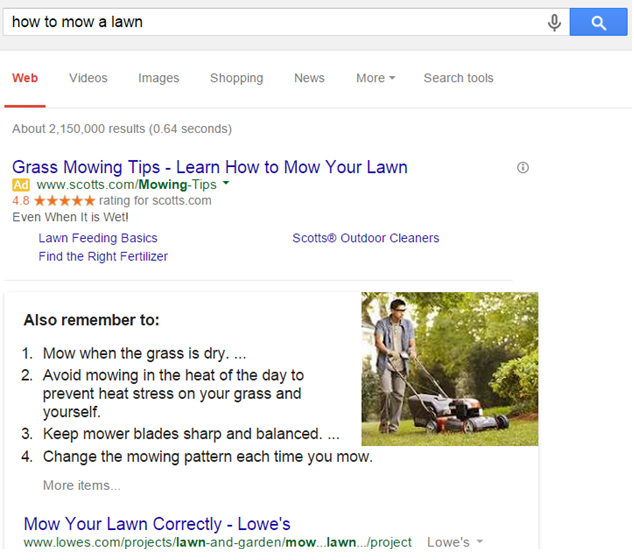 How does Google determine which pages qualify for an answer box result? Ever since new answer box results started appearing in search, marketers have been speculating as to which factors may be influencing these results. In a recent post on answer box type results by search and social media marketing expert Mark Traphagen, he points to the notable occurrence of step-by-step instructions that are found in many answer boxes and suggests this may improve the chances of your answer being selected as an answer box result. Other digital marketing experts including Moz’s Cyrus Shepard, pointed to anchor text as an influential factor. Bill Slawski provides us with more insight into how formatting your content can in a way that search engines can more easily recognize an answer to a query. Now that we’ve provided some context surrounding what an answer box is and potential factors that influence getting an answer box result, let’s discuss research tools and methods available to understanding what questions your customers are search for and how often. Lets start with the free tool most of you use already, Google’s AdWords Keyword Planner. A few weeks ago, I was informed that by adding in modifiers such as “who, what, how, why, when, does, and where” along with the topics I was researching, the tool would return only questions along search volume (HT: Shay Wright for the tip). Let’s pretend for a moment that I operate a growing lawn care business, and I’d like to start creating evergreen content surrounding the most frequently asked questions people have surrounding the topic. Now that I have my keyword and words to include, I’ll click “Get Ideas” and because there’s search volume, I get results that group the questions into Ad groups. Nice, right? 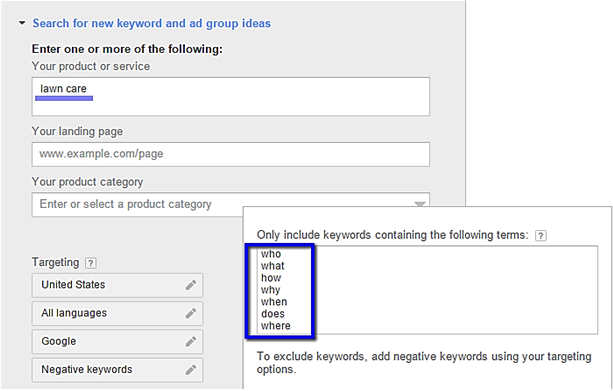 This free keyword suggestion tool collects and aggregates search suggestions (auto complete), and allows users to download the results. After you have initiated a search for a query, you’ll want to select the “Only questions” option in the left sidebar menu. This keyword suggestion tool is an API-first application and has some phenomenal Chrome extensions that can enhance your keyword research across multiple tools (if you use Ubersuggest, I’d highly recommend exploring this further). 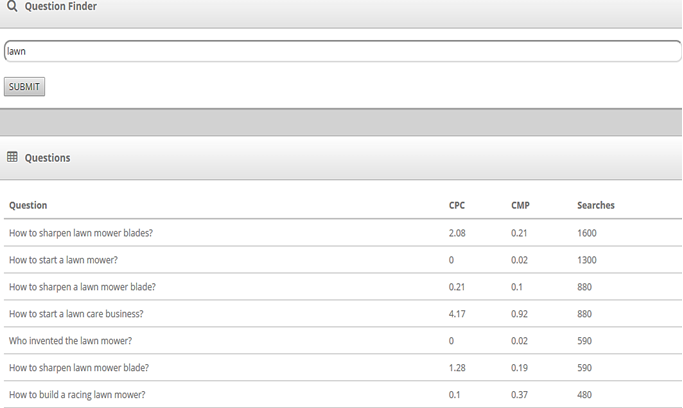 Similar to SerpStat, GrepWords also has a specific question feature built into the interface. 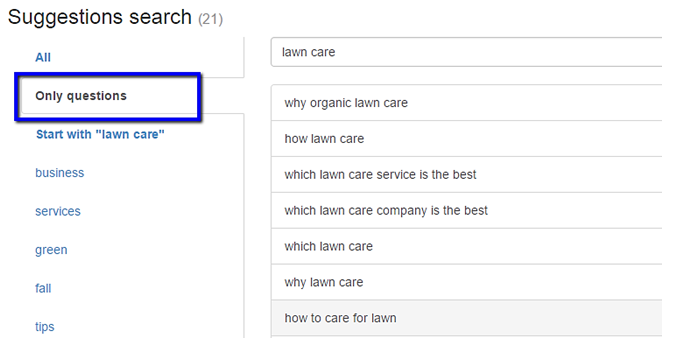 The downside is that it only allows for one keyword to be searched for at a time so the phrase “lawn care” will need to be entered as just “lawn.” Depending on the query, this limitation can cause irrelevant results to be returned. While the tool doesn’t have an export feature, copying and pasting into an Excel workbook or Google Sheet is easy. In doing a quick spot check, it looks like there are already answer box results for many of the questions that were returned during my research for lawn care related questions. There was surprisingly little overlap between the three tools (only two questions came back as duplicates) making it a nice combination to use for this question research. However, there are quite a few other tools/research methods for discovering questions being asked by potential customers. If you have an internal site search feature on your website and tracking has been enabled in your analytics tool, you’ll be able to get a feel for the questions visitors have when on your website and if their finding answers. Meeting with with your sales team to compile a list of FAQs could assist you with content ideas, work to improve the visitor experience, and save your team time by pointing customers to a new FAQ resource page. Q&A sites or forums like like Quora, Yahoo Answers, Ask.com or Answers.com can prove to be an valuable resource for not only finding questions, but also to serve your community by providing informative answers and establishing your brand as an authority on the topic. If your website is set-up and verified in Google Webmaster Tools, you’ll be able to access the “Top queries” report to see what keywords (and questions) are already receiving impressions and leading to new visits. This report is actionable in that you can seek to strengthen relevancy through optimization for questions you are already receiving impressions for, and format your answers in a way that may increase the chances you’ll get an answer box result. Whether your website gets an answer box result or not, understanding and resolving the questions (needs) of your prospective and existing customers is the real reward. Providing value, thought leadership, and working to make your website a destination will not only help you improve your presence in Google Search but also work to provide a better experience for your site’s visitors. What tools are you currently using for question research? Brian Jensen is the Owner & CEO of Congruent Digital, a boutique online marketing agency that provides clients with a customized, audience-first approach to digital marketing. Connect with him on Twitter, Google+, and then try Congruent Digital’s Tweet Indexation Rate Tool.